Palate: off dry, medium acidity, medium(+) intensity, a little too high on alkohol, my guess correct: 14%. Typical notes of green apple, white flowers, chalky minerality, elderflower and a bitter peach. White pebber comes crawling over the tongue with lemon fruit as well. Very nice balance with clear focus on the fruit and nice minerality. Long finish with plenty of clean fruit. Conclusion: Very good quality, drink now – will not develop further. My guess: top level New Zealand Sauvignon Blanc 2007. Afterthoughts: Impressive! A very good development on this wine, still plenty of fresh fruit and intensity. I guessed 4 years off on a Sauvignon Blanc? Imagine that, not good…. 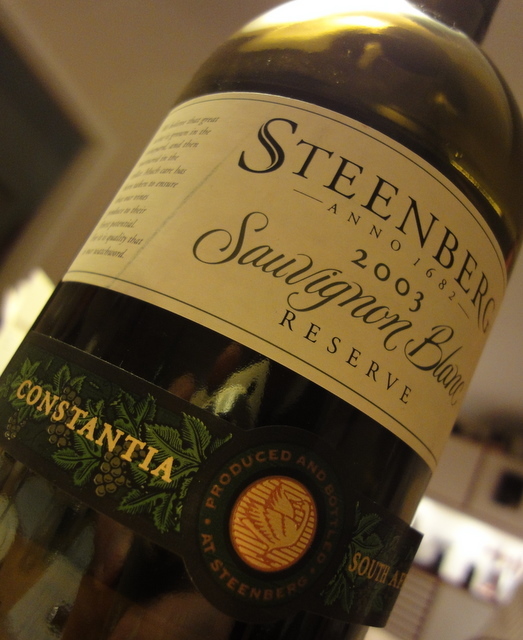 Disclaimer: I work for the importer of Steenberg here in Denmark.